Those fond of rhyming market wisdom will recall that “the trend is your friend,” but the hard truth is that trends can be fickle. Just when you think the trend you’ve been riding for weeks or months is your BFF, it turns on you, leaving you to ponder another market rhyme: The trend is you friend, until it ends. 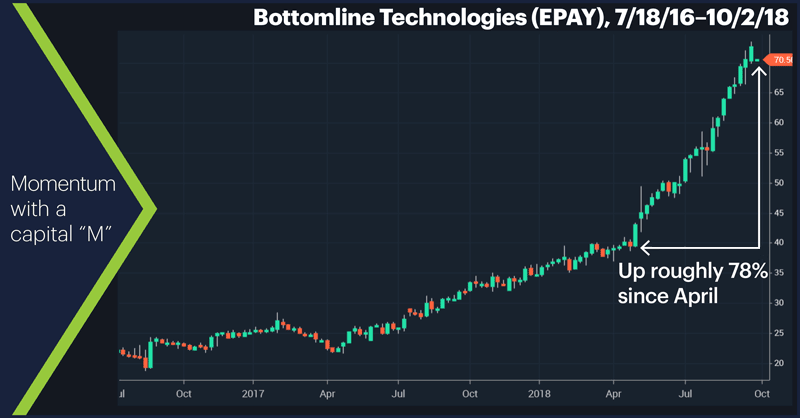 Digital payments company Bottomline Technologies (EPAY) has likely made a lot of friends over the past couple of years, having nearly quadrupled from its August 2016 low and gaining more than 100% this year—78% just since April 30 (chart above). 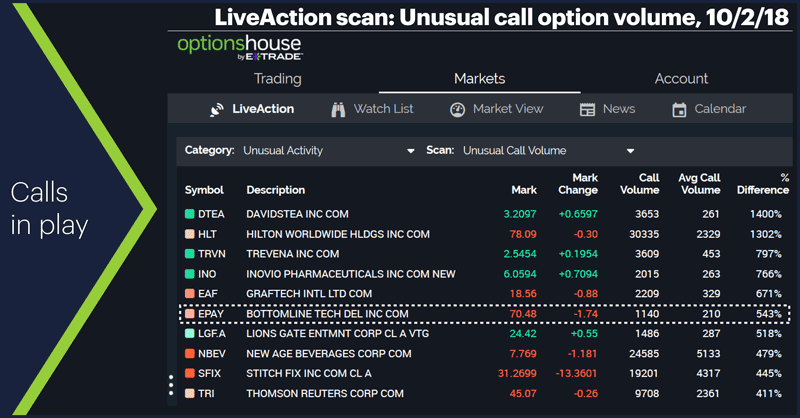 Some contrarians may think the so-called “smart money” is shorting call options because they expect more downside, but given the absence of unusual volume on the put side, until the uptrend is proven to be kaput, momentum bulls could be positioning for more upside. The question is not whether the latter group is correct (again), it’s where they’d decide they’re wrong—that is, where they’d place a stop-loss order to protect themselves in the event of further selling. 1. Below the most recent (yesterday’s) low. This would be the most conservative (smallest loss) stop, but also the most likely to get triggered. Traders using a “tight” stop like this would likely assume the recent pullback was another one- or two-day event (e.g., the down days in early and mid-September). 2. Below the next-most recent swing low ($66.31, September 18). This stop has a lower chance of being hit, but it would also result in a larger loss. Coincidentally, it would allow for a pullback about the same size as the one from July (visible at the far left of the chart). Of course, bulls who thought the current pullback could extend to the September lows may choose to enter closer to that level. They key aspect of any stop level is that it should be based on the realities of price action, like the examples above, not an arbitrary dollar amount you “feel comfortable” risking. Because, ultimately, the markets don’t care if you’re comfortable. Market Mover Update: Brookfield Asset Management (BAM) traded 1.5% lower yesterday following Monday’s conspicuous high open/close bar. Monday it was the Nasdaq 100 (NDX), yesterday it was the Dow Jones Industrial Average’s (DJIA) turn to make a new record high, with an assist from Intel’s (INTC) 5% intraday surge. Despite trading in a narrow range, November WTI crude oil futures (CLX8) hit $75.91/barrel yesterday, the highest level in almost four years. Today’s numbers (all times ET): ADP Employment Report (8:15), PMI Services Index (9:45), ISM Non-Manufacturing Index (10:00). 1 Zack’s Equity Research. 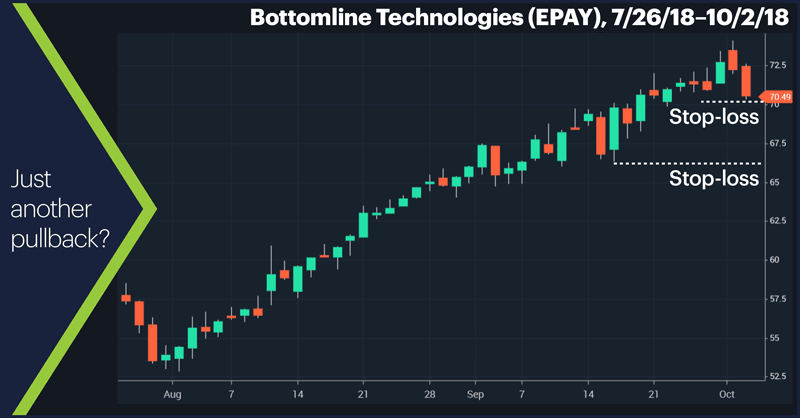 Here's Why Bottomline Technologies (EPAY) is a Great Momentum Stock to Buy. 9/26/18.